In the spirit of Christmas, and to celebrate the end of our second fantabulous year of the 52-Week Illustration Challenge, we would like to offer members a sparkling, optional BONUS CHALLENGE. From 1 December to 24 December, we invite you to post a Christmassy, advent-style series to the wall. 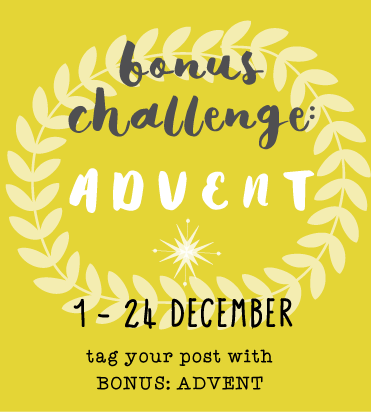 Each day’s image should include a number from 1 – 24, and make sure you tag each artwork BONUS: ADVENT in your post description. We realise this is very short notice and it’s a busy time of year! But here at the Challenge, we love to foster the importance of taking time out, slowing down, being mindful and practicing your art! If spending 30 minutes a day or an hour a week on this CHRISTMAS ADVENT bonus allows you to Be—during this mad-rush time of year—our task is done. So, if you can take up this bonus challenge, fantastic—but if you can manage only a few days, no worries at all. Whatever you'd like to do is wonderful by us. Advent images should not be posted until that particular day has arrived. So on 1 December (Day 1), only Day 1 images can be posted. On 2 December (Day 2), both Day 1 and Day 2 images can be posted, and so on. Just like the Challenge’s weekly themes, Advent days CAN be back-dated (you can play catch up at any time). We hope you have fun, we and we look forward to seeing what you can produce for this sparkling, Christmassy, bonus challenge! From our team to each and every one of you—we wish you a joyful and utterly creative Festive Season.